Concerned with the possibility of another Democratic administration, the National Rifle Association (NRA) is targeting Democratic front-runner Hillary Clinton. Like her husband, former President Bill Clinton, Hillary has a record of advocating for commonsense approaches to reduce gun violence. As first lady, she co-convened a White House Summit on School Violence after the Columbine tragedy. She also strongly defended the Brady Bill, which instituted federal background checks on some gun sales. As senator, she co-sponsored and voted for legislation to close the gun show loophole by requiring criminal background checks on all transactions taking place at events that sell firearms. She voted against the dangerous immunity protections Congress provided gun dealers and manufacturers that prevent victims of gun violence from holding negligent manufacturers and dealers accountable. She also co-sponsored and voted for legislation to extend and reinstate the assault weapons ban. Hillary also has a comprehensive plan to address increased gun violence in America to include: increasing the number of gun sales subject to background checks; repealing the gun industry’s unique immunity protection; revoking the licenses of bad-actor dealers; keeping guns out of the hands of domestic abusers, other violent criminals and the severely mentally ill. 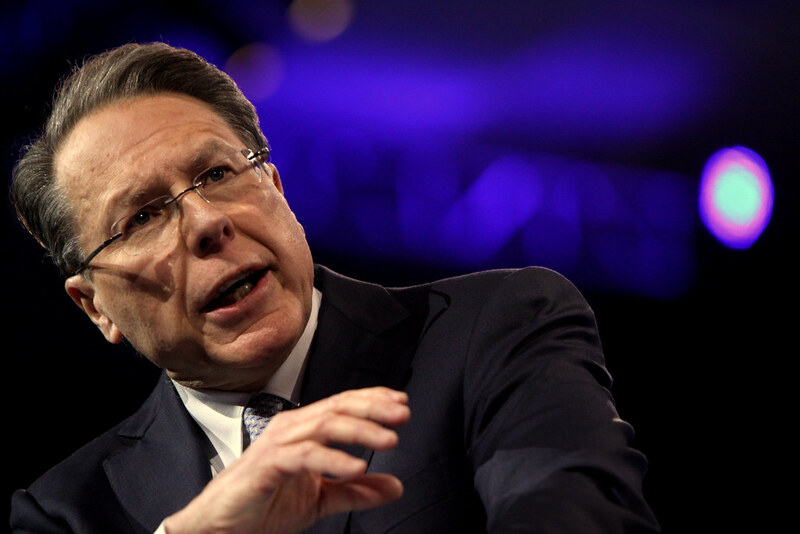 However, the NRA is not addressing Hillary’s well-documented record or her plan to curb gun violence – instead, like Republican presidential hopeful Donald Trump, NRA CEO and Executive Vice President Wayne LaPierre attempts to connect Hillary to her husband’s administration as well as that of President Obama. Take for example the video at the bottom of this article which has been viewed almost 3 1/2 million times since it was posted on Facebook. After a rambling – and deliberately frightening – prologue using race-baiting words like “thugs” and “criminal gangbangers” to lay the claim that it is Washington and not the NRA is to blame for increasing gun violence, La Pierre launches his attack on Hillary. President Clinton and Vice President Gore have established a tough records of enforcement of our nation’s gun laws by helping law enforcement take serious gun criminals out of our communities and put them where they belong: behind bars. The number of federal firearms cases prosecuted by the U.S. Attorneys increased 16 percent, from 4,754 in 1992 to 5,500 in 1999. And, by providing federal, state and local law enforcement and prosecutors with the tools they need to crack down on gun criminals, overall gun prosecutions have increased 22 percent. In addition, the average sentence for federal gun offenders has increased by nearly two years, and federal law enforcement is successfully targeting the most serious gun offenders. Between 1992 and 1998, the number of federal gun defendants sentenced to prison for three years or more went up 20 percent, and the number sentenced to five years or more went up 12 percent. However, this overlooks the fact that – due to the efforts of the NRA and other gun lobbying groups – the country does not have a gun registry program which makes it virtually impossible for law enforcement to identify these “thugs” and “criminal gangbangers” LaPierre so warmly refers to…. You can watch the clip, below, but be prepared to grimace – we did.